CORAL GABLES | Catholic medical professionals and students now have a support group they can turn to as they face the ethical challenges presented by today’s society. “The practice of medicine for Catholic doctors is difficult, because there’s a lot of secular influences,” said Father Alfred Cioffi, chaplain of the Miami Guild of the Catholic Medical Association. Posing for a photo after the White Mass Nov. 13, from left: Dr. Felix Rodriguez, president of the Catholic Medical Association in Palm Beach; and Dr. Felipe Vizcarrondo, president of the Miami Guild. 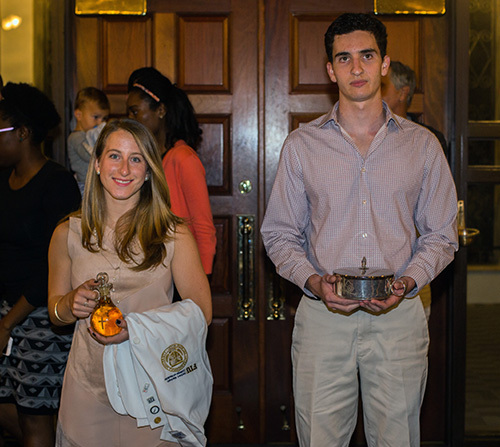 Ashley Mila, an FIU medical student, and Victor Moas, president of the University of Miami chapter of the Catholic Medical Association, bring up the offertory during the White Mass for medical professionals celebrated Nov. 13 at St. Augustine Church and Catholic Student Center in Coral Gables. 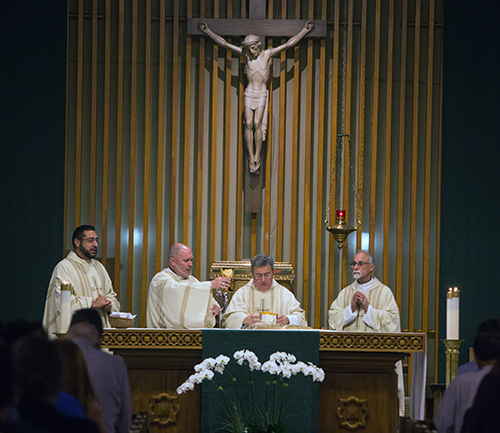 Celebrating the White Mass at St. Augustine Church in Coral Gables Nov. 13, from left: Father Robert Ayala, parochial vicar at St. Augustine; transitional Deacon Alexis Ibarra; Msgr. Tomas Marin, pastor of St. Augustine and a medical doctor himself; and Father Alfred Cioffi, St. Thomas University bioethics professor and chaplain of the Miami Guild of the Catholic Medical Association. Father Cioffi is the director of St. Thomas University’s Institute for Bioethics, and its Florida Blue Endowed Chair in Bioethics and STEM. Bioethics is the study of ethical, social, legal, philosophical, and related issues arising in health care and the biological sciences. Father Cioffi said that the Catholic Medical Association in South Florida is growing little by little. Dr. Felipe Vizcarrondo, a retired pediatric cardiologist, is president of the Miami Guild. The FIU Herbert Wertheim College of Medicine, which opened in 2009, recently formed a CMA chapter. The White Mass, which got its name because medical professionals wear white coats, helped kick off the chapter. Several FIU medical students joined members of the University of Miami CMA chapter at the Mass. Belle McDermott and Tim Brown, from Nova Southeastern University College of Osteopathic Medicine, also joined the UM and FIU medical students. They don’t have a chapter there — yet. 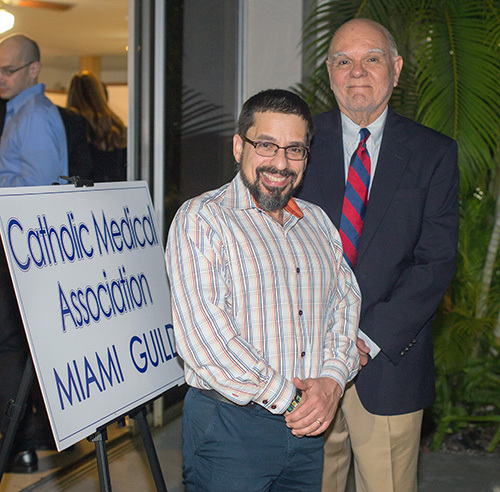 For information on the Catholic Medical Association’s Miami chapter, email: MiamiGuildCMA@gmail.com.